Fujinomiya side of Mt. Fuji (富士宮口) is south side of Mt. Fuji which you can view from Tokaido. It has great views of Izu Peninsula, Hakone, Shizuoka, and Kanto. On the far side, you can also see the pacific ocean. There is a mountain trail of Mt. 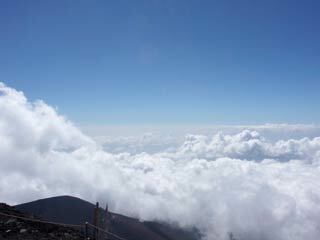 Fuji, called Fujinomiya Climbing route which you can enjoy this view. On this trail, you can see Hoei Volcanic vent which erupted most lately in 1707. The Hoei Eruption of Mount Fuji started on December 16, 1707 and ended about January 1, 1708 during the Edo period. Although it brought no lava flow, the Hoei eruption released some 800 million cubic meters of volcanic ash, which spread over vast areas around the volcano, even reaching Edo almost 100 km away. Cinders and ash fell like rain in Izu, Kai, Sagami, and Musashi provinces. The eruption occurred on Mt. Fuji's east?north-east flank and formed three new volcanic vents, named No. 1, No. 2, and No. 3 Hoei vents. The catastrophe developed over the course of several days ―an initial earthquake and explosion of cinders and ash was followed some days later with the more forceful ejections of rocks and stones. Mt. Fuji has not erupted since. Hokusai's One Hundred Views of Mount Fuji includes an image of the small crater which developed from a secondary eruption site on the southwestern slope. This was called Mt. Hoei because the eruption occurred in the fourth year of Hoei.